Each buoy, approximately 12 meters in diameter at the surface, produces 150 kW of energy, or approximately enough power for 150 homes. Ocean Power Technologies expects to be producing buoys that generate 500 kW by 2010. Ocean Power Technologies has developed a patented system that captures energy from waves-combining modern electrical and electronic engineering with the traditional buoy-and is now looking to fully commercialize it, including at Wave Parks in the state of Oregon. During the 1970s oil crisis, when people were panicking and lining up at gas stations in the U.S., electrical engineers Dr. George Taylor and Dr. Joseph Burns were contemplating solutions. They came up with an idea for capturing the energy from waves. But Taylor doesn't remember that there was a "eureka" moment. ** "We knew we needed a cheap way to produce mechanical motion. And I was born in Perth, Australia, the home of great surfing beaches, and understood how strong waves were. So that may be how we started putting the two together." The idea, since developed over the 1970s and 1980s, became a reality in 1994 when Ocean Power Technologies (OPT) began operations in New Jersey. "The purpose of the company was to develop a system that could convert the enormous amount of mechanical energy in ocean waves into low cost electricity, be cost competitive against fossil fuel, and ultimately do this without any subsidies or tax credits," says Taylor. That has continued to be the goal of the company as it's grown from five to 40 people-10 at the subsidiary in the U.K. servicing the U.K. and Europe, 30 in New Jersey, and one in Australia. "We're at the point now where the development of our technology is completed and we're looking to fully commercialize it," says Taylor. 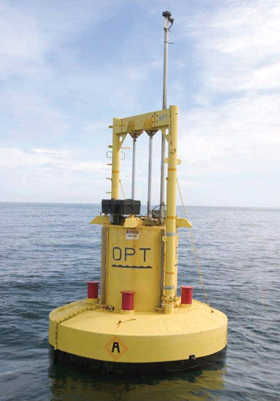 OPT's technology combines modern electrical and electronic engineering with the traditional buoy. Taking the energy from the wave and turning it into electricity is deceptively simple. The company's PowerBuoy consists of a long cylinder (spar) approximately six feet in diameter that is attached to a buoy under the water. A donut-shaped float around the cylinder slides up and down with the force of each wave. That mechanical motion drives hydraulic cylinders inside the spar, creating pressure that turns a hydraulic motor (also inside the spar). The motor is connected to a conventional three-phase electrical generator, which produces electricity that is then transferred to the grid through an underwater cable. Each buoy, approximately 12 meters in diameter at the surface, produces 150 kW of energy, or approximately enough to power 150 homes. Taylor says that by 2010 the company will be producing buoys that generate 500 kW. But what makes OPT's system unique is its patented electronic system. 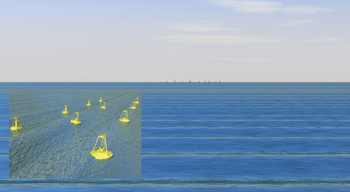 Each buoy is equipped with its own computer and sensors allowing the generator to capture the maximum energy from each wave. "As each wave begins to lift the float, the sensors are able to predict its length and amplitude," Taylor explains. "During the first 100 milliseconds, as the wave starts to grow, the generator is automatically adjusted into the optimum state for capturing the energy." OPT's wave power stations-or Wave Parks-consist of an array of these high-tech buoys. They are placed approximately 50 meters apart, and ideally in about 50 meters of water. "That gives us a large amount of wave power and at the same time we're not in deep water, which would be more expensive to operate in," says Taylor. Oregon could soon have three of these Wave Parks in operation-one at Reedsport, which would produce up to 50 MW (100 buoys), and two larger parks in Coos Bay and Newport, each producing 100 MW (200 buoys). OPT is focusing its efforts in Oregon based on the state's interest in being a key player in the field. "The Governor publicly stated that he wants to make Oregon the wave power capital of the U.S.," says Taylor. "Oregon has a need for power and a great wave energy resource." Taylor adds that what's great about Wave Parks in Oregon and other western states is that their grid lines run very close to the coast. "When we bring our underwater cable ashore, we can make connection to the grid very easily. We don't have to run miles of new transmission line. That's a big advantage." The company's business model is to build Wave Parks-consisting of buoys, cable and connection to the grid-and then sell them to a utility. Afterwards, OPT would handle the operations and maintenance contract. The ocean is a tough environment, and OPT would follow the same maintenance procedures that the U.S. Coast Guard does for its navigational buoys. For example, a buoy must be taken from the ocean every four years, cleaned and repainted. "If buoys are properly maintained, they will last 40 years," says Taylor. "Our expected lifetime for our power station, being a little more conservative, is 30 years." The onboard computers also assist with the maintenance. "It's one of the advantages of the electronics," says Taylor. "Various sensors on board record everything-temperature, pressure, the amount of current, the amount of voltage it's producing, the distances the float's moving, and the size of the wave. All that data, for every buoy, is fed into the power cable, which has imbedded in it a fiber optic cable for communication. This allows us to continually monitor every buoy we put in the ocean, anywhere in the world." The buoys went through a full permitting process in Hawaii, and were found to have "no significant impact" on the environment. In fact, fish like them. "As soon as we put a buoy in the water, small fish immediately start to swarm around it," says Taylor. "They see it as an artificial reef and feel more secure because it throws a shadow." And the larger sea animals like whales and seals are used to buoys and easily navigate around them without confusion. The same is true with boats. ** "On each buoy there's a flashing light, a fog horn and radar reflectors. They are also marked on the maritime maps as a wave energy power station," says Taylor. "We've been putting our systems in the water for more than 10 years and there's never been a significant problem." People find the Water Parks agreeable as well. Typically two or three miles off shore, they're rarely visible from land. "And because most of the buoy is below the surface, we don't run into the issue wind farms have with obstructing views," adds Taylor. In fact, they can be downright hard to find. "We have a system that's been operating for a year off the coast of New Jersey. Every time we take people out to look at it we have to use our GPS system to find it," says Taylor. But OPT is also aware that some folks just want to take a peek at the energy-producing buoys. Although the buoys aren't dangerous and the power is contained inside, the company has "Beware - High Voltage" signs posted to keep people away. OPT produces the buoys in two parts. It subcontracts the manufacturing of the buoys themselves to a local facility. In Spain, for example, the buoys for the power station there are being built at the city of Sandander, near where the wave power station will go. The same will be true in Oregon. The smart computer part of the system, however, is built and assembled in New Jersey. "Because this portion is relatively small, we're able to ship it anywhere in the world. Our business plan is to focus on the intellectual property side and, of course, manage the overall program," says Taylor. Despite competition, OPT believes they are the leader in wave energy. "We think that it's good that there is competition," says Taylor. "If this is going to be a big industry, there has to be more than one company in business. We just want to be ahead of the pack. And we've been very fortunate in that we've been able to raise capital for the company." OPT was listed on the London Stock Exchange four years ago. It was listed on NASDAQ this past April. Now with the necessary capital and a team of skilled engineers, they are ready to move forward. They have already contracted with an impressive list of customers, including: the U.S. Navy; utility giant Iberdrola (said to be the largest renewable energy operator in the world); Total, a French oil company; the Scottish government; and most recently the Oregon utility PNGC Power.
. Security: powering radar systems that could check the coastlines for terrorists or drug runners. and carbon, but an easier process is to use electricity to separate water into hydrogen and oxygen. When electricity generated by waves becomes inexpensive enough, it will already be near the water source. "The two will go together very nicely," says Taylor. These applications and others like them may be a ways off, but wave energy has definitely arrived and it's here to stay.